Nothing on the paper roll chart indicated that the next right turn would cause each one of us in the party to pause and question the path forward. The map showed “county road” but we were convinced that what lay ahead of us was merely an ATV trail. 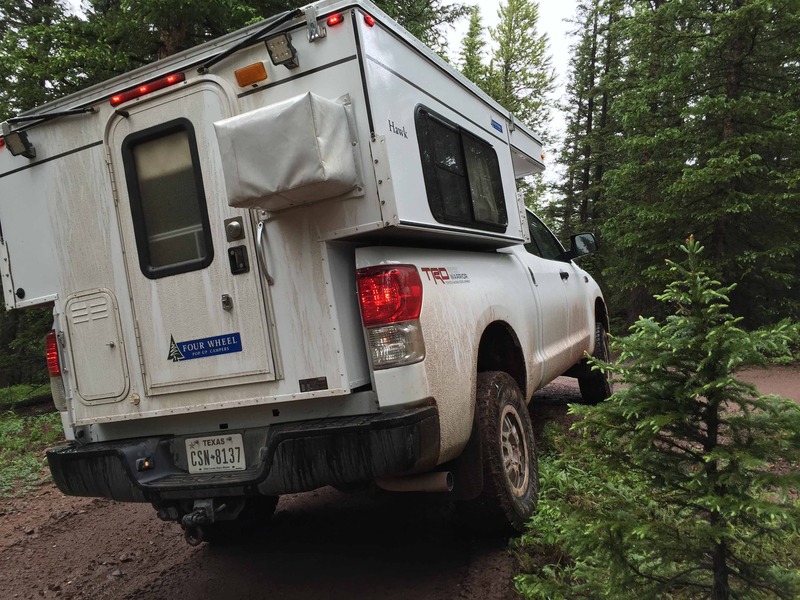 Looking back, we don’t know why we were surprised that a path developed for adventure motorcycles may not be well suited for full size trucks, not to mention one carrying a new Four Wheel Camper (FWC) requiring 8 feet of headroom. 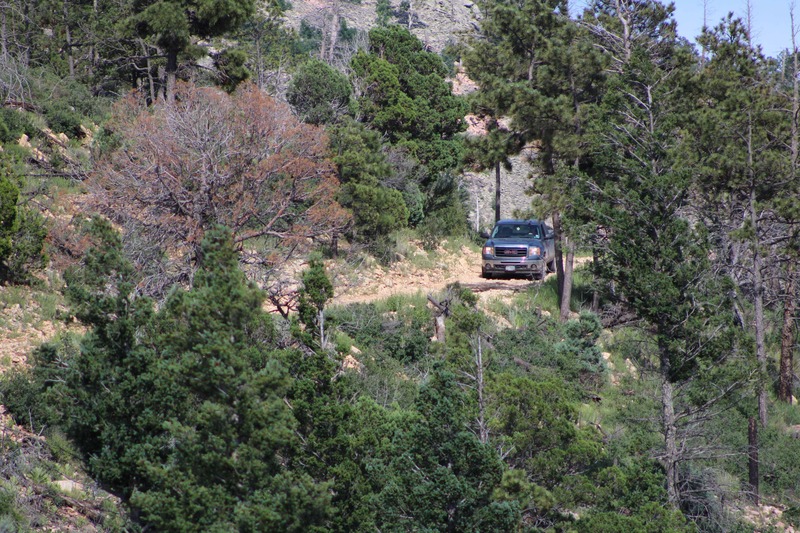 The trail was steep and trees closed in, scratching at both sides of the vehicles. The local rains the night before left the trail slippery and just as the stock GMC passed through a very tight, off camber spot between two trees, a wet root under the rear passenger tire caused the back end of the truck to slide within inches of an awaiting tree. With the advantage of seeing what line not to take, our Tundra/FWC combo squeezed through the tree maze with the grace of an elephant ballerina. Emerging from the forest section the trail we continued to climb, ultimately to 11,450 feet, and opened to a virtually treeless 360º view of the surrounding mountains. It was unanimous that this would be camp for the night. Throughout the evening, group after group of ATV riders passed, each with confused looks on their faces to see two full size trucks on such a trail. A few stopped to inquire what we were doing while others were flat out lost and used our maps (and extra fuel from our reserve) to make it back to their camp…just before more overnight rains. 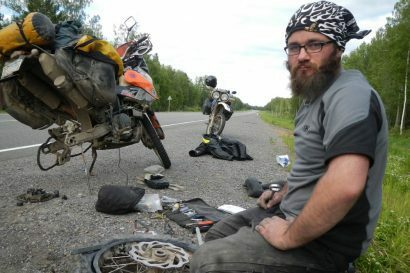 One year prior during an internet search for dirt road routes in the US I came across an internet video about Land Rovers traversing the Trans-American Trail (TAT) which is a 4,000+ mile trail system set up by Sam Carron for adventure motorcyclist. 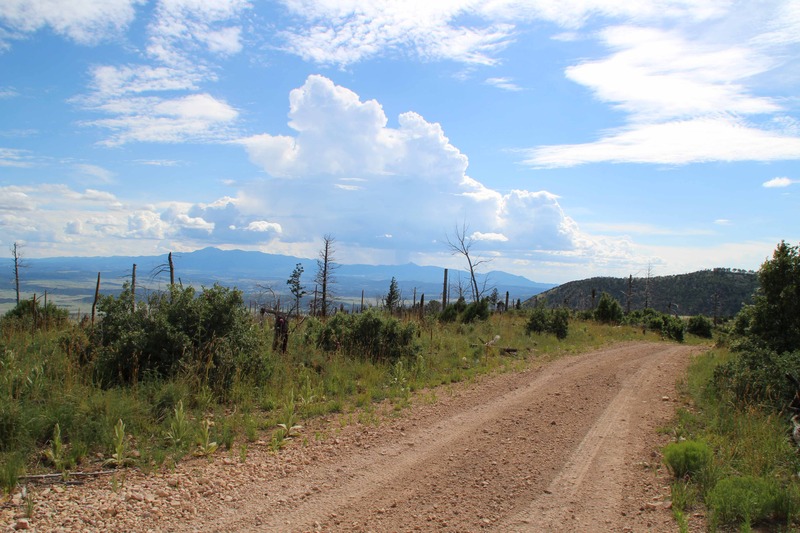 However, an alternate segment of the TAT, known as the Shadow of the Rockies (SOR), lends itself to a less time intensive TAT experience (Trans American Trail). 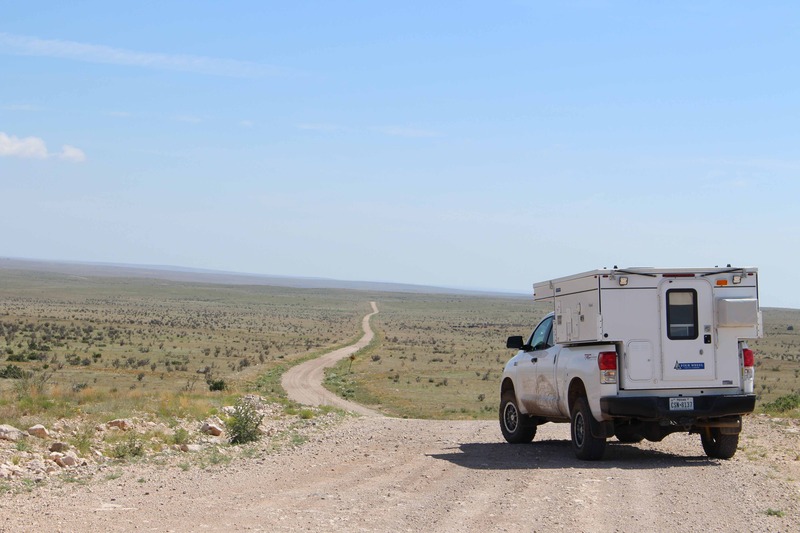 The SOR starts in El Paso, Texas and travels 1,400 miles north to the Colorado-Wyoming state line, 95% of which are dirt roads. 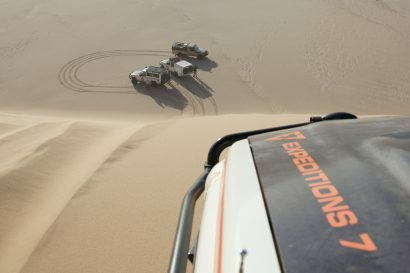 One comment/question in particular on Sam’s TAT website came from Susan Adrian “Can the Shadow of the Rockies Trail be done in a 4×4 vehicle?” The idea was that if a few spectacular Land Rovers led by legendary Camel Trophy expert drivers utilizing superb traction control gizmos, which alone should carry them weightless over any terrain, can do 4,000+ mile off piste trail couldn’t two “normal vehicles” do a 1,300+ mile mini version? Someone had to answer Susan’s question, why couldn’t we. My wife and I are the proud owners of a 2014 Four Wheel Camper Hawk model which is chauffeured around by our 2013 Toyota Tundra, Rock Warrior Edition. 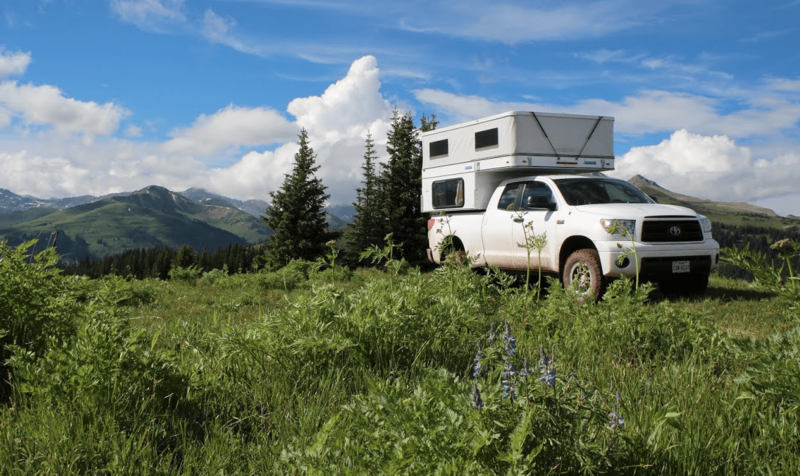 For a lack of a better name the truck/camper combo is known to us as TOD (Toyota Overland Development), Weekend Warrior Edition. To help TOD shoulder the FWC and gear it has been upgraded with an OME 2.5” medium lift, rear Air Lift airbags utilizing Daystar cradles, and a Streetacos Carrier Bracket. We are banking on Toyota’s legendary prowess to make up the rest. Convincing my wife, Kim, of this endeavor was much easier than expected but we really wanted at least one additional vehicle along for safety in numbers and to make sitting around the campfire more entertaining. While pitching the idea to my friend Joe, maps were laid out, pictures were presented, and adventures promised. At the end, with one word, he said, “sure.” Joe’s 2011 GMC Sierra 1500 was prepped with nothing more than a spanking new set Cooper AT3 tires (stock size) and a bed cover…period. Joe picked up the set of Coopers two weeks before the trip to replace the original tires whose tread looked more like the surface of a bowling ball than a tire. Tires could be considered an upgrade by some but the truck just flat needed new rubber. Taking a stock truck will either demonstrate that a huge number of vehicle mods are not necessary…or we will discover that the professionals were right about certain components, I’m guessing a little of both. From only a map and Google Earth it is difficult to gauge just how fast or slow a particular trail might be unless you have been there before or have some other access to local knowledge, we had neither. 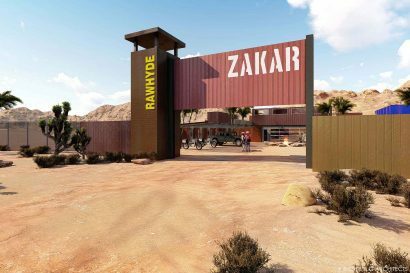 Fortunately, the TAT is very popular within the adventure motorcycle community and the general consensus indicated the Shadow of the Rockies could be completed in 6-8 days depending on riding style, yet there was no record of it being done in a truck. When discussing the trip with my wife and Joe we had originally settled upon 6.5 days on the trail with an extra 1-2 days built-in as a buffer. Two weeks prior to the start of our trip, my job decides I should relocate to Denver by the end of August, so now my wife and I have to find a place to live in less than two months. Rather than kill the trip it was decided that those buffer days were going to be spent apartment hunting, which trimmed the time allotted for the trail down to FIVE days. If we couldn’t make it to Wyoming in time, Kim and I would peal off towards Denver and finish the trail some other time. We all agreed to do everything we could to finish. The TAT begins just outside of El Paso very near Hueco State Park, which is famous for ancient rock art and rock climbing and is worth a visit if you are in the area. If you are planning to camp at the park, plan to get there by 4:30pm as check-in is lengthy and requires watching a mandatory video on protecting the park. Check-in ends at 5:30pm and the gate closes by 6:00pm SHARP. We pulled in at 4:25pm after a 10 hour push across Texas from Fort Worth. Our campsite at the base of the giant Hueco boulders felt secluded while we prepared dinner and double checked gear as tomorrow would be our first day on the trail! Pressed for time the trip started bright and early that first morning with ominous rain clouds building in the distance. 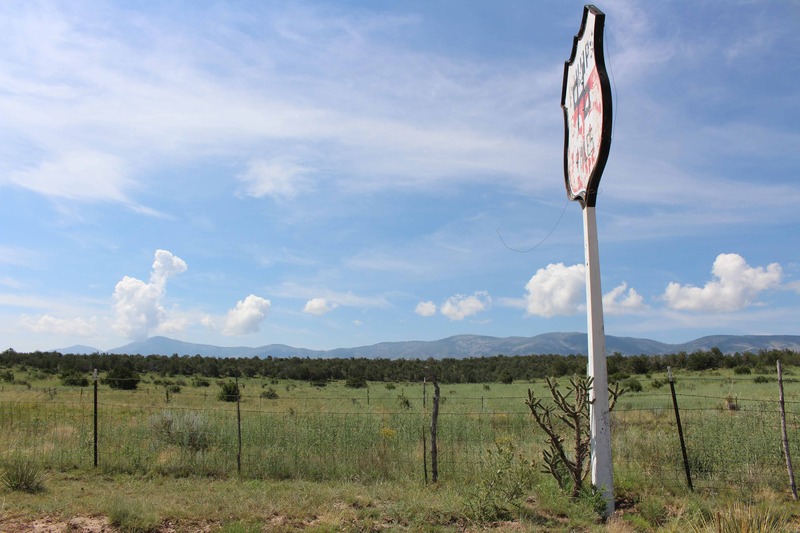 The roads leading from El Paso into New Mexico would be considered tame by most, however, as evidenced by the washed out arroyos we crossed, if the rain hit the conditions would deteriorate rapidly along the old ranch roads. The first day was a balance between making miles and yet still trying to soak up the scenery. What looked like barren flat land on Google Earth turn out to be a very interesting and diverse desert environment. Coming out of the desert we arrived at what would be our first campsite on the trail, just outside of Ruidoso in the Capitan Mountain range. At the base of Capitan Mtn. we rolled up on a couple camping and we inquired about the condition of the trail further up. The husband mentioned that he had driven about 2 miles down the path but was unsure if the trail was passable due to the amount of recent rain the area. Our group decided to press on with the daylight we had left and find a suitable campsite along the way. 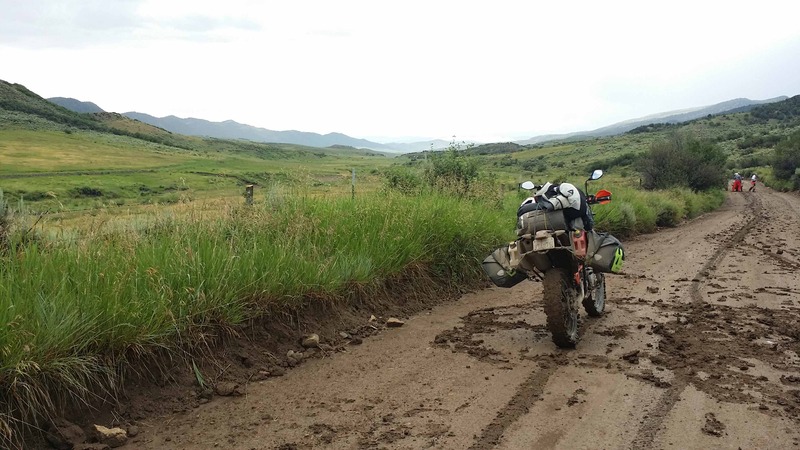 So far the roads had been tame, graded dirt until that next morning, when conditions rapidly degraded. Another early start, feeling fresh, trucks humming, and already set in 4-wheel drive, “what could be better,” or so I thought. The stranger from the night before was correct, as this section of road was certainly much less manicured than those traveled the day before. Progress slowed to a crawl while both trucks tried to avoid undercarriage damage from the bowling ball size rocks littering the road. 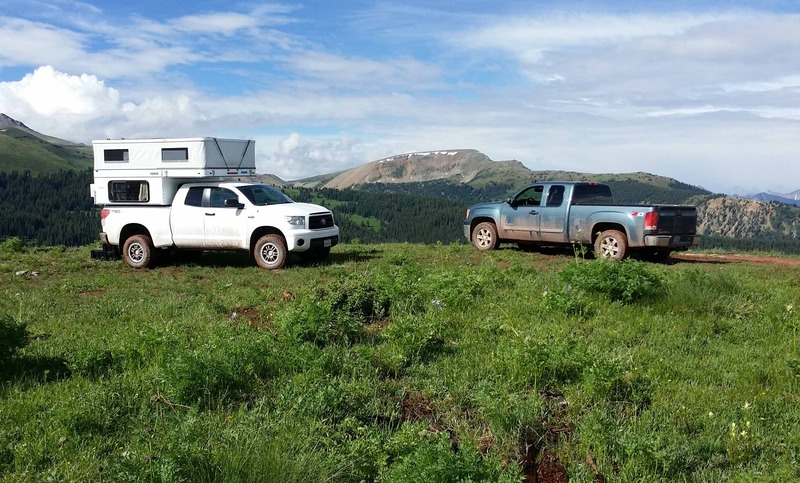 The tonnage of the camper kept TOD’s tires firmly, if not reluctantly, planted while the stock GMC just tried not to leave its front air dam on the trail in shambles. This section is where the already compressed schedule was being greatly put at risk. While exhilarating, we had planned for this section of the trail to take only 1 hour, but by the time we were off the trail and back on faster surfaces we were 4 hours behind schedule, essentially half a day evaporated. Leaving the Capitan Mountain Range behind, it was time to put some miles down if we were to make Wyoming in time. Luckily, after coming off the mountain we were greeted with more gravel roads. With a better understanding of the trucks capability and a higher comfort level of our own skills, the speed picked up and we were making up time. The road, while fast, dipped up and down plateaus, through farmland, and past scenery the highways totally ignore. It should be noted that this is the only part of the trail that we all agreed would be impassable if raining. Gaping ruts in and out of the ditches left by local ranchers taking cattle to market was clear evidence that these roads can get messy. Fortunately, conditions were dry but every cloud in the sky threatened to increase the difficulty of the trip. We would regrettably call an overcrowded campground our home for the night of the 4th of July. Fireworks until 2am do not make for a restful sleep, but the trail beckoned and we needed to make up time. And make up time we did! Through these less stressful sections, our speed picked up to the point that would have made a WRC driver proud. Not typically one to disobey speed limits, we were able to find the sweet spot for our Toyota to conquer the endless miles of washboard roads, not to mention the positive impact it had on our schedule. Joe later admitted to turning off his traction control for a little more fun! 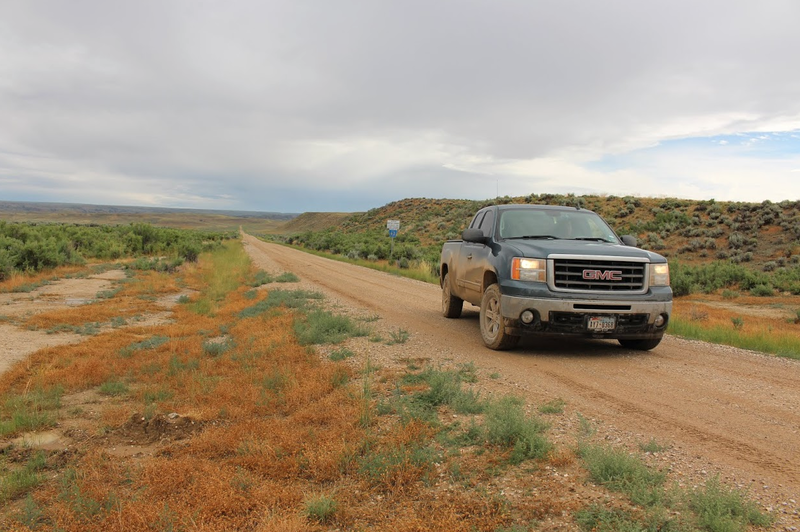 New Mexico was almost complete, but not without tackling Long Canyon Road. 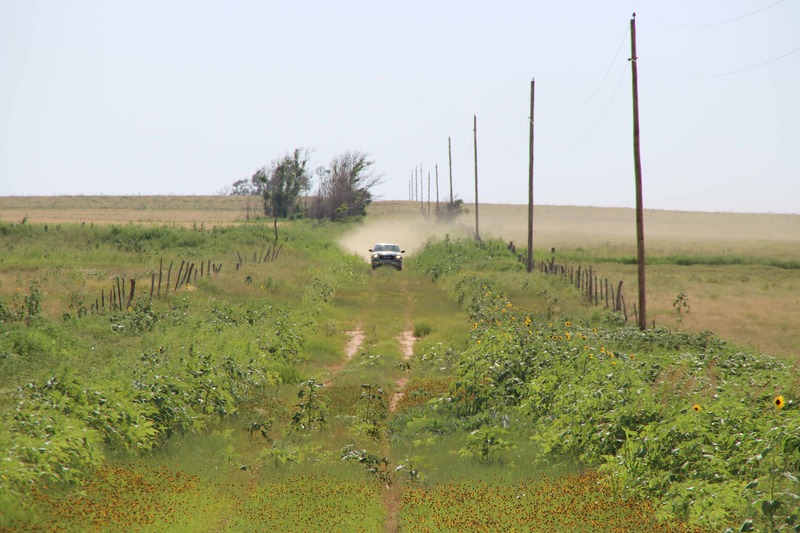 Well known by SOR riders taking the trail, it is less known in 4×4 communities. Armchair scouting did not reveal much about this short section of trail but an email to Mark with bigdogadventure.com assured me we would be fine. Mark was right and while not particularly difficult, it did offer a slight pucker factor (for a flatlander) when looking over the edge at the valley below. 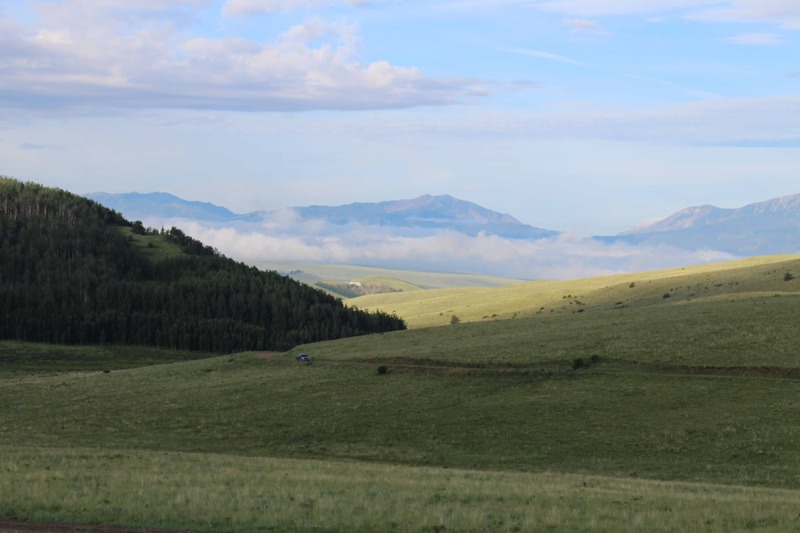 We were rewarded with a spectacular view from atop the plateau and the start of Colorado! Sam’s instructions were to ride into Salida during daylight hours so we took his advice and pulled up short at Lithrop State Park and enjoyed their $1.25 showers. Sam was right when he alludes in his notes that the best is yet to come. This day would prove to be the most trying, yet rewarding. The mountains were getting taller, roads steeper, and the landscape transformed from desert to alpine. Both trucks were excelling in the terrain, although the thinner air started to cause the RPM’s to rev a little higher. 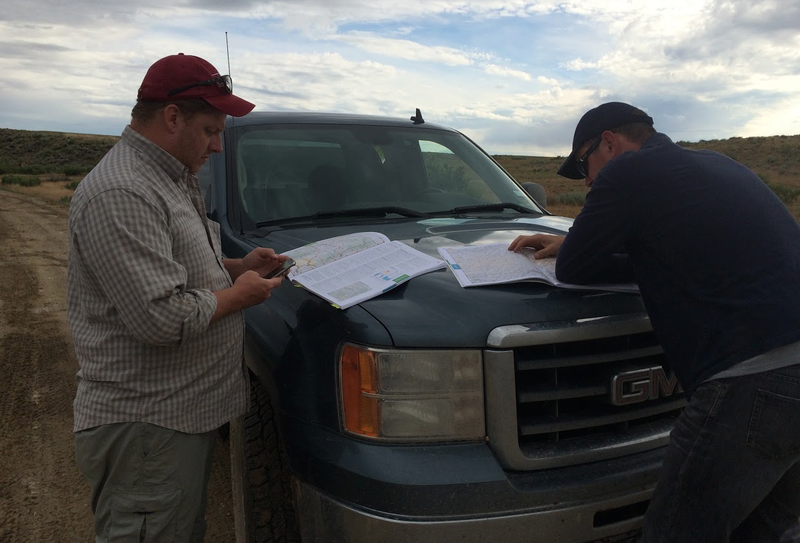 Reviewing the remaining roll chart against the map showed that a majority of the remaining route was county roads with one exception…Tincup Pass. I personally was looking forward to Tincup Pass and the image of taking a classic truck/camper poser shot next to the sign at the peak ran through my head. Guidebooks made the pass sound doable and considering what we had been through already on this trip it should be a fun run up the mountain. 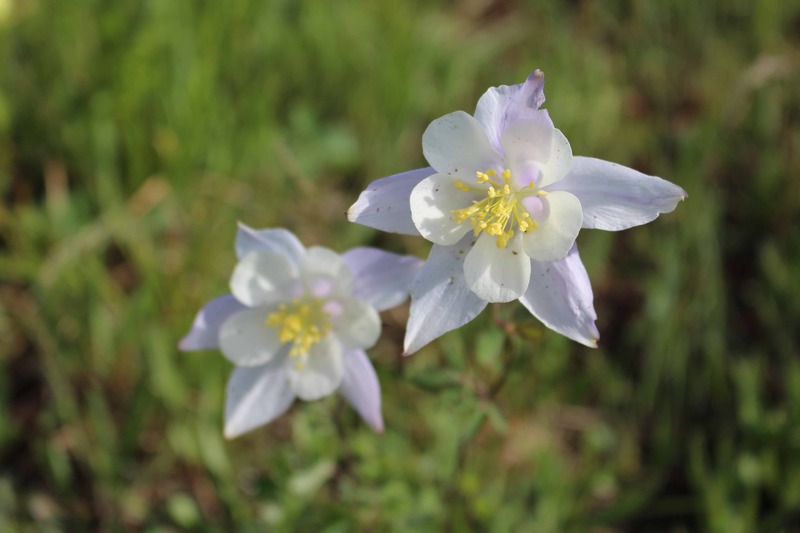 Mother Nature however had other plans in the form of recent rains and runoff from snowpack. 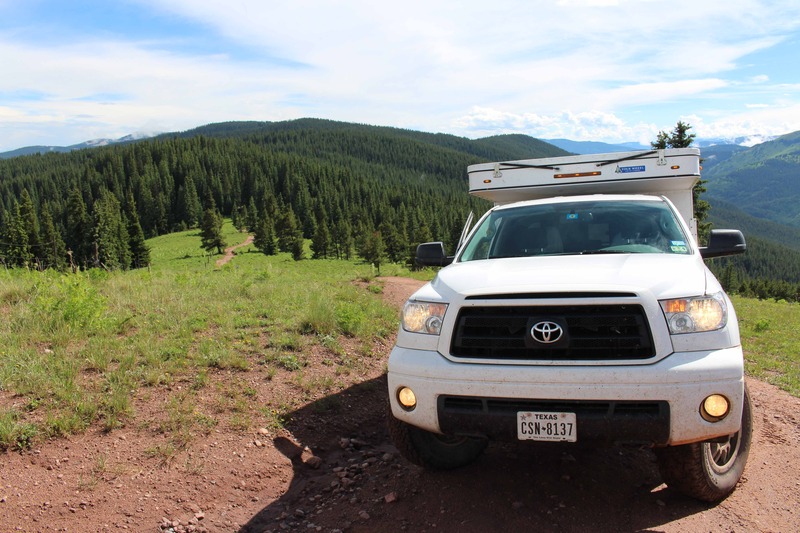 Many passes in Colorado can be closed until late July, so we called the local Ranger office for a status update. The Ranger on the line, while chipper, gave grim news that the lake at the approach to the pass was flooded, water covered the road, and the pass was closed. With no time to be sour we reviewed the trail maps to find a suitable and “adventurous” alternative. Sam highlighted Cottonwood Pass as an easier alternative and the end of the pass intersected almost exactly where we would have exited Tincup. With our compressed schedule and goal to stay on the trail we really had no alternative. Snapping a killer flexy pic at the top of Tincup would have to wait for another time. What Cottonwood Pass did do for us is save an estimated 2 hours of trail time and kept the goal of reaching the border the next day within reach. It was at this point we danced our elephant sized trucks over the river and through the woods to what ended up being the best campsite of the trip. Waking up to a spectacular sunrise the following morning, our rigs were immediately set to 4-low. We hoped today would be be the final push to Wyoming, our schedule demanded it and a slow start could force us to pull up short. The descent from our overnight camp matched the slow methodical pace from the evening before, but the distance remaining was short and within two hours we were down the mountain and refueling at the next waypoint. Coming out of the rockies and heading west we entered rolling hills and more fast dirt sections. The spring rain had turned the grass on the hills a bright green, the local cows were fat and happy, but sections of road were slicker than what those happy cows were depositing. Think of the skid pad at a BMW test track. It was in this particularly slippery section we noticed fresh motorcycle tracks snaking down the road, obviously from someone finding life on two wheels a bit more challenging. Not two miles further we found a group of three TAT motorcycle riders. Two bikes upright (KTM) and one bike on its side in the ditch (BMW). 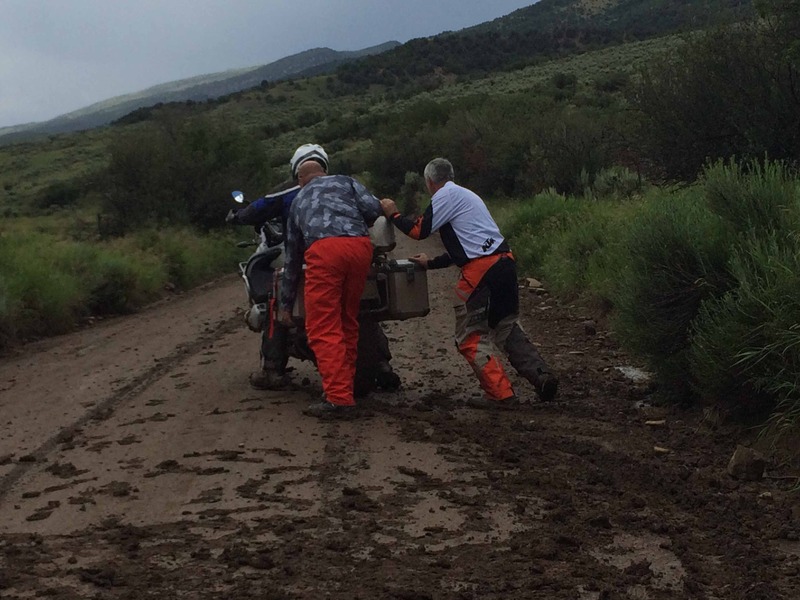 Everyone was fine and smiling (at least the KTM guys were) but the BMW was having a hard time dealing with the mud. 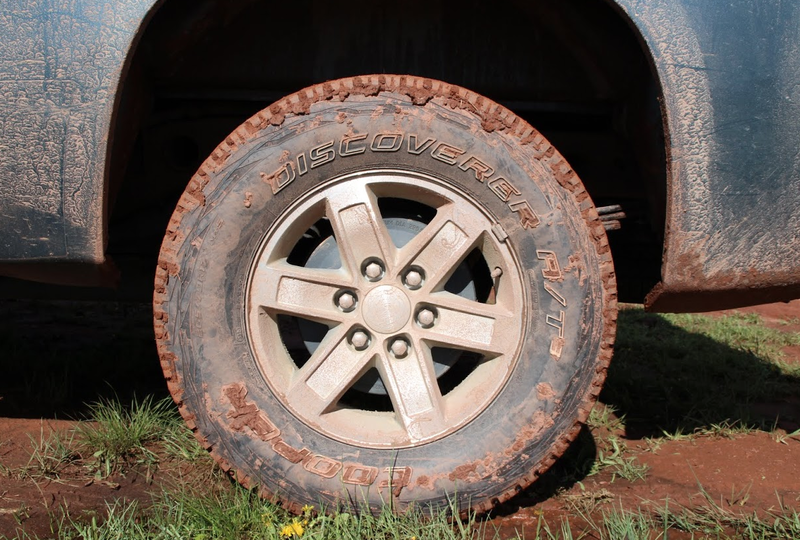 Mud would stick to the front tire and jam up under the fender, eventually locking the front wheel and leaving it pushing rather than rolling. Each time ending with the big BMW laid over. After offering assistance (and a frosty cold drink from our cooler) we wished them luck and mucked past them, fortunately finding better road just 2 miles beyond. Although the roads were a little wet and muddy in places, the rain held off for the final push to the border. My mind wandered during this last section as to what would await us at the end. Images of checkered flags, balloons, champagne, and podiums came to mind. The same reception one would receive after winning the Baja 1,000. The last few waypoints had us driving down oilfield roads, past bobbing pumpjacks. 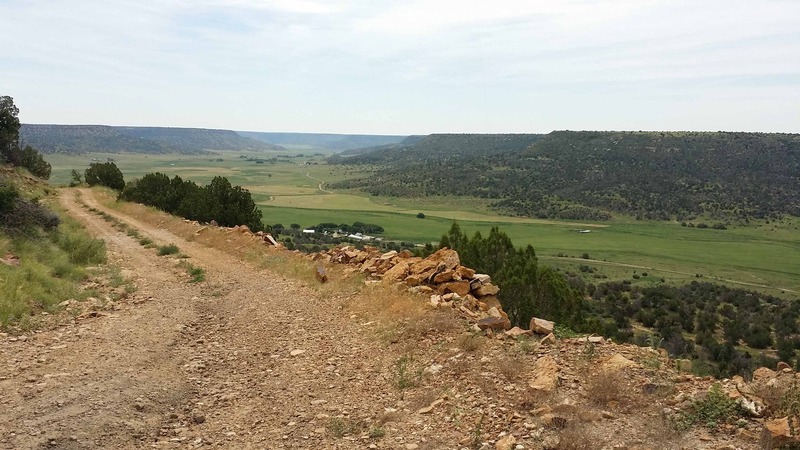 While crossing yet another cattle guard and motoring our way to the finish, a radio call comes from Joe, “Aren’t you guys tired of driving yet…you passed the border.” My wife and I looked at each other and then at the roll chart and realize in our excitement we were one waypoint behind. 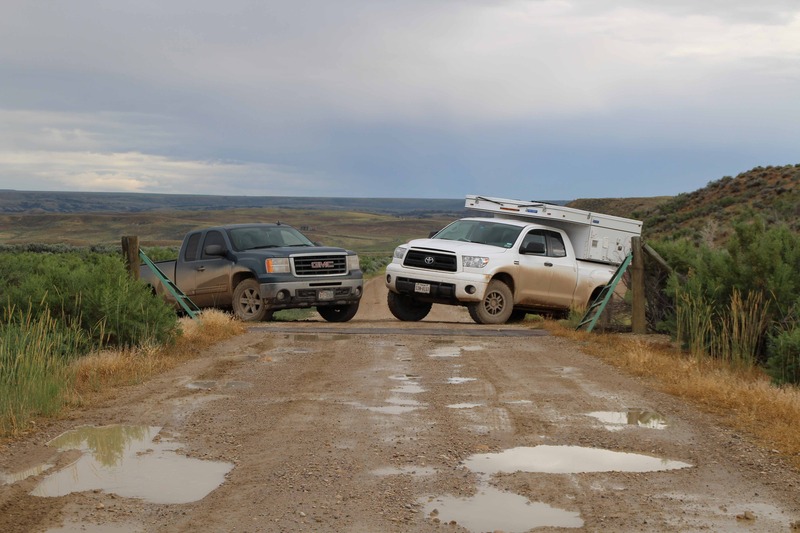 The unassuming cattleguard, 1 out of 1,000 crossed in the 5 days, turned out to be the border of Colorado and Wyoming and the finish of our 1,400 mile dash! 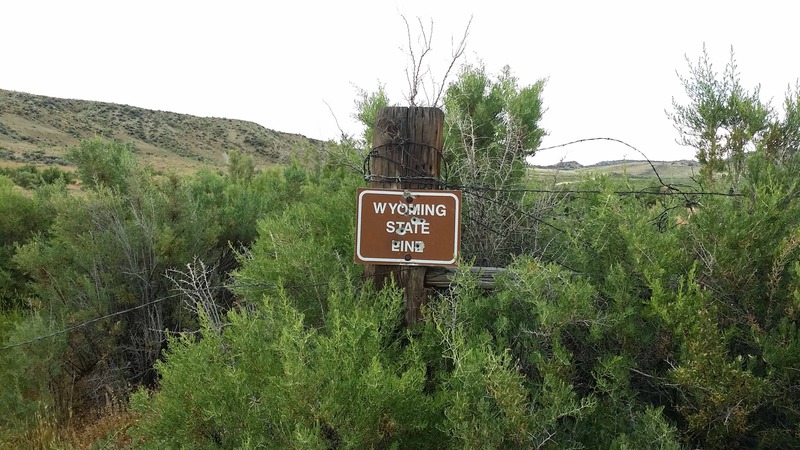 In the middle of an oilfield, at an unassuming cattleguard, nailed to a barbed wire fence post, was a small brown bullet-riddled sign indicating the Wyoming State Line…not even one balloon. A fitting end to a trail that kept us off the beaten path but definitely wanting more. To Susan Adrian: The answer is Yes! The trail can be done in a 4×4 and adventure is promised. Notes: The Sierra had zero issues during the 1,400 trail miles and the only two complaints were; the amount of dust that leaked around the seams of the tonneau cover, and how the low air dam killed more grasshoppers than ever thought possible. Raising the front of the truck with quality leveling kit or short lift would have lowered the stress level in rocky sections. Fast washboard sections broke the rear loose a few times and careful tire placement was necessary in the rough stuff however, the truck soldiered on without complaint. The Cooper AT/3 tires show very little signs of wear and now after a wash look good as new. Notes: The OME suspension really performed better than expected with an estimated 1,600 lbs of camper, gear, and people. The sport shocks kept the rear wheels planted and the airbags kept things level even during our more “spirited” driving. In the technical stuff clearance was never an issue and from the driver seat the truck felt nimble, leaving us feeling confident. A larger fuel tank would have been convenient but we were never worried about making it to the next gas station. I’m convinced that keeping the whole package as stock and light as possible, as much as a truck/camper combo can be, while only upgrading those areas necessary to support the heavier payload is the secret to a competent rig. Features: All the standard Hawk model options plus; “king” bed upgrade (I’m 6’6” so extra pads can be inserted allowing me to sleep bow to stern), flush mount appliances, Yakima roof rack rails, A/C, and smooth exterior fiberglass siding. 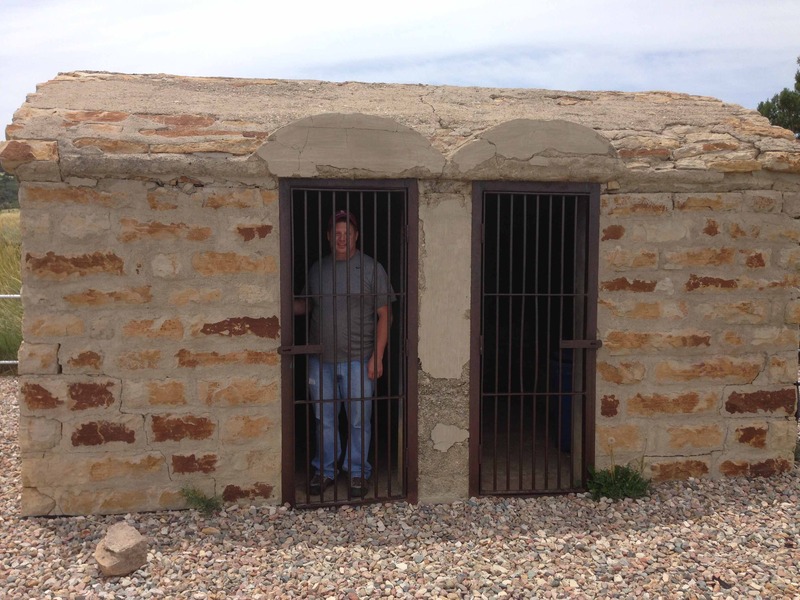 Notes: It was 102º at the campsite in El Paso the night before we were to embark and we felt a small twinge of guilt turning the A/C to cold knowing that Joe was to spend the night in his tent. We had that same feeling when it was below 40º and raining on top of a mountain later in the trip. We did however sleep great both nights. While we cooked outside most evenings we took advantage of the hot water for cleanup and with 20 gallons of fresh water on tap running dry was never a worry. Storage on any trip can be an issue if not managed properly. All our standard gear fits into the many camper storage compartments but packing clothes for both hot and cold weather posed an issue. Borrowing the idea from Jonathan Hansen’s “JATAC” we use three Front Runner Wolf Pack boxes for steps into the camper which doubles as a linen closet of sorts. When stored inside the camper, two boxes fit perfectly on the floor in the dining nook while the third box is strapped on top of the storage area midship. 3-4 more boxes would be helpful but at $40/each we decided to put that money towards fuel in the truck instead. After returning home and giving the camper a good wash, every inch was inspected for evidence of damage or stress. None were found and the smooth fiberglass sides do not even show scratches from the many tree branches that so lovingly brushed by in the tight spots. Cleaned up and aired out we are ready for the next trip!